First Church of Christ, Scientist, Mystic, Connecticut is located in scenic downtown Mystic at 5 Gravel Street one block north of West Main Street. 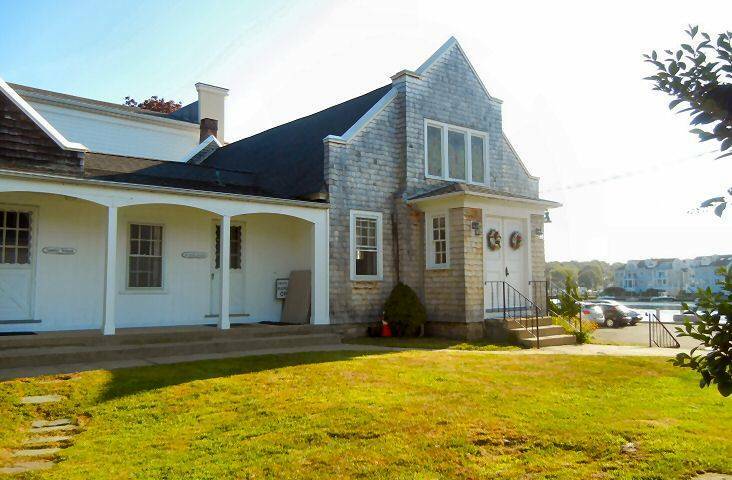 The church was established in February of 1899 and moved to its present location on Gravel Street in March of 1914. The original edifice dates back to 1782, to Josiah Kemp, owner and builder. Transformation of the dwelling into a church structure was begun in 1918. Opening day services and dedication of the newly completed church structure were held August 30, 1919. 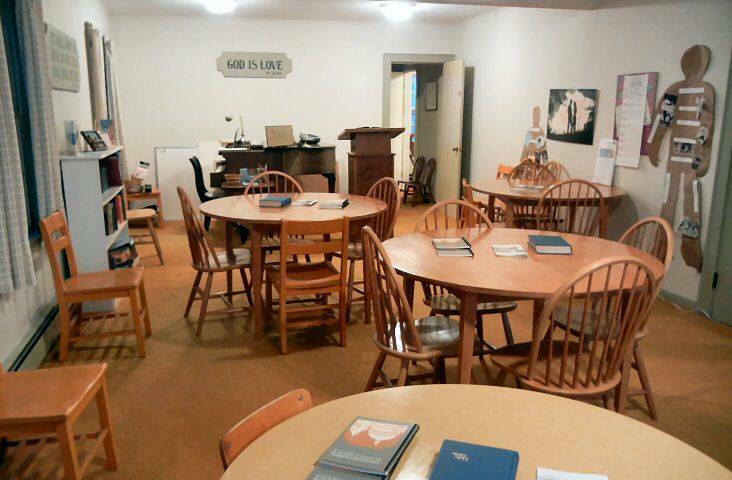 The present day Sunday School and Child Care room were not added until June 1962 and it was not until 1975 that the original dirt cellar on the street level of the building was converted into a Reading Room. 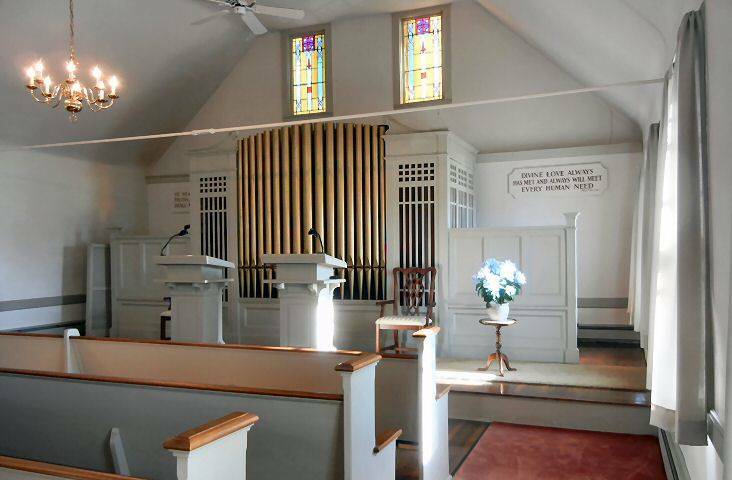 First Church of Christ, Scientist, Mystic, Connecticut is but one of the many branch churches of The Mother Church, The First Church of Christ, Scientist located in Boston, Massachusetts. All over the world people are gathering in these branch churches each Sunday to hear that week’s Bible Lesson Sermon read aloud. You are warmly invited to attend our Sunday service. The members of the First Church of Christ, Scientist, Mystic also welcome you to our Wednesday evening testimony meetings. The Sunday service is open to the public, and you are most welcome to stop in and join our service. 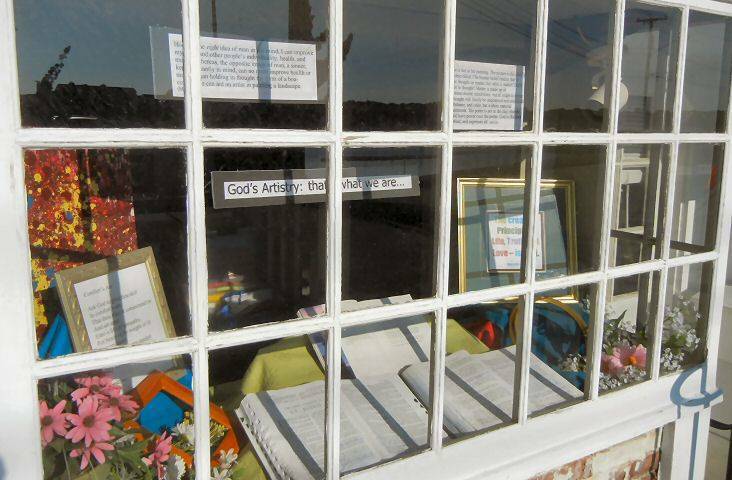 Our service is comprised of hymns, prayer and that week’s Bible Lesson Sermon, consisting of passages from the King James version of the Bible and the Christian Science textbook, Science and Health, with Key to the Scriptures, by Mary Baker Eddy. These two books are the Pastor of our church, as ordained by Mrs. Eddy, the author of our textbook and the discover and founder of Christian Science. Our Sunday school is held at the same time as the Sunday morning service and welcomes pupils up to the age of twenty. Students are taught the Scriptures and how to apply God’s laws in their daily living. The youngest classes start at three years of age. The basis for instruction is the Bible, including the Ten Commandments, the Lord’s Prayer with its spiritual interpretation, and the Sermon on the Mount. Older classes are taught from the Weekly Bible Lesson Sermon. We invite you to join us in our Wednesday evening meeting, which includes reading from the Bible and Science and Health, followed by testimonies from the congregation. You will hear individuals testify how they are applying the teachings of Christian Science to their daily lives. Loving care for infants and small children is available during the Sunday morning and Wednesday evening services in our Child Care Room, adjacent to our Sunday School. 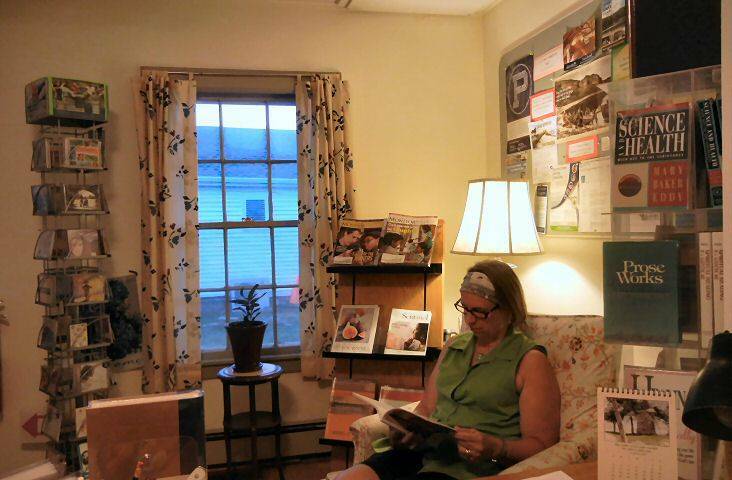 Our church maintains a Reading Room for the community in the church edifice. The entrance to the RR is to the left of the main church entrance. The Bible, the Christian Science textbook, Science and Health with Key to the Scriptures by Mary Baker Eddy, as well as other reading materials such as Bible commentaries, dictionaries, pamphlets, biographies of Mary Baker Eddy, children’s books and literature published by the Christian Science Publishing Society may be borrowed, purchased or studied in this quiet, peaceful atmosphere. The Reading Room is a wonderful place to catch up on the most recent periodicals, including our international daily newspaper, the Christian Science Monitor, or to study the week’s Bible Lesson-Sermon or just quietly pray. There is always an attendant available to answer any questions you may have about Christian Science. A computer is also available for reference use and comes with Concord program to research the Bible as well as other writings of Mary Baker Eddy. Children are welcome to visit the Reading Room as well. 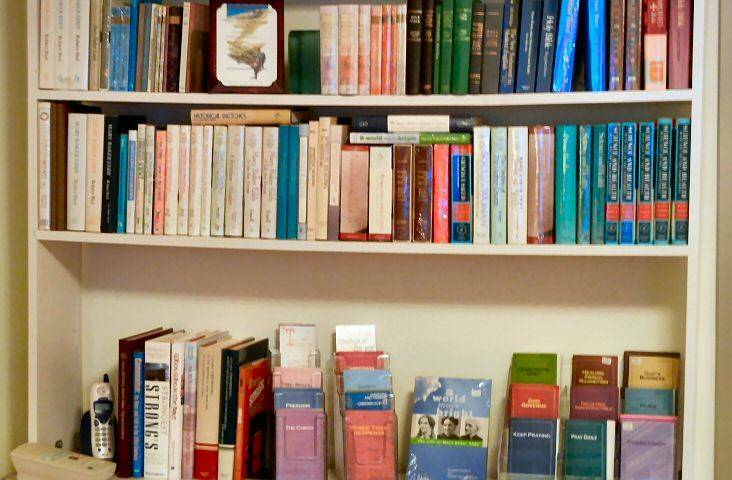 Many children’s materials, books, games, puzzles and pamphlets are available to read, borrow or purchase. christianscience.com This official web site of the Mother Church provides detailed information on Christian Science. Answers to frequently asked questions are presented, as well as information on a variety of topics such as Mary Baker Eddy (the Discover and Founder of Christian Science), and Christian Science publications, lectures and broadcasts. www.spirituality.com This web site explores practical spirituality from a Christian Science viewpoint by providing information on spirituality, wellness, self/identity, relationships, career/workplace, and financial security. Tuesday 11AM-2PM and briefly following the services or by appointment.